The riots happened behind closed doors. This is not some deep metaphor about how the real conflict lies within our broken homes, but a simple observation that for most people the riots happened outside, behind their firmly shut front doors. territorial army and heroically defended our communities or they were scum looting our corner shops. The coverage of the riots failed to report them in a way that most people saw them – detached. Throughout, journalists have gone to extraordinary lengths to try and pull the proceedings apart to state what they really mean for society as a whole. For me, the most startling observation was that it was not the rioters, the police or knife wielding Kurdish militias who were the main players. It was you. You who sat behind your computer and TV screens watching events unfold. You who would rather watch it all unfold on a 24 hour news coverage loop than step outside your front door to see for yourself. Could you imagine a more graphic illustration of our apathetic, isolated and unconcerned society than people sat flicking between Sky news and BBC News 24 unable to distinguish between the noise on their TVs and the noise coming from the street outside? Was it through fear that people kept their bums firmly planted on the sofa, or was it apathy? Of course, when I describe you, I also describe myself. My experience of the riots after coming back from holiday to Peckham was one of outside observation. If I had been in my house on Monday night at the height of the violence would I have wondered down Rye Lane to see what was happening, I doubt it. I would have justified my lack of action to myself through reducing the risk to myself or something. Would I have regretted this lack of action? Maybe. Yet this apathy and reliance on the media brings with it real danger. Those who I have spoken to in Peckham who did venture out have talked widely of the events being over played in the press. The significant violence in Peckham, it would appear, was concentrated to just a few hours on Monday night. Equally, walking down and around Rye Lane it looked like predominantly chain stores had been attacked, despite media reports and focus on the small independently owned businesses being attacked. The riots were painted through a lens designed to sell papers (“TODAY 8 page riots special”). The realities of recent events are far less glamorous. Disenchanted people watched their TV as disenchanted people stole things from our shops. What sets Peckham apart though from other communities that faced riots is that you do not need to even speak to people to begin ascertaining people’s actual views. 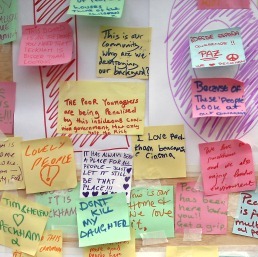 Pinned on multi-coloured post-it notes on “Peckham’s peace wall” there are messages of people’s reflections, feelings and reactions. 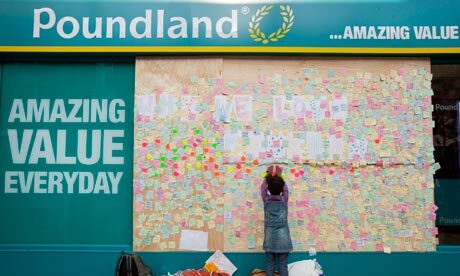 The wall, covering part of Poundland’s broken window will be kept in Peckham Library and will be available for all to read. I would urge you, even if you missed the events as they unfolded, to go and read some of these firsthand accounts that vary from the trivial to the deeply moving. Otherwise my predictably middle class reader, you are as bad as I am.